Is there food in that pocket? Greyhounds are very clean, intelligent and big couch potatoes sleeping approximately 18 hours a day. Click below to learn more about this ancient breed. All of our Adoptable Greyhounds are in foster homes where they are learning about retired life. 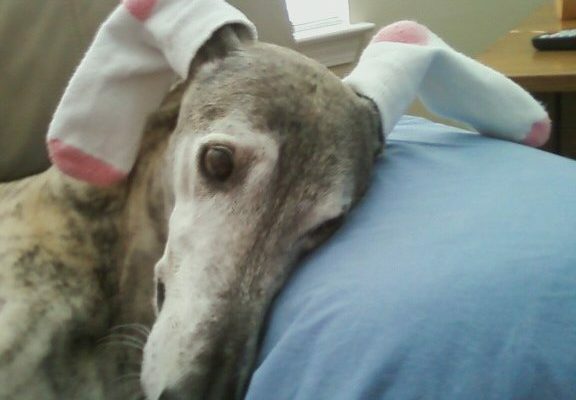 Enjoy reading about our current adoptable greyhounds. Our on-line Adoption Application is designed to better recommend suitable adoptable greyhounds to you. Apply today for a chance to adopt a greyhound. Want to meet some greyhounds? Greyhound foster dogs and ambassadogs would love to meet you! So come out and meet the dogs and their people! Rocky is very friendly, sweet, curious and medium energy. His tail is frequently in helicopter mode and he likes giving kisses. He has a playful side; pouncing on stuffies and shaking them wildly. Click here for more information. New doggies will be arriving in April 2019. Check out all our beautiful greyhounds looking for fur-ever homes at Adoptable Dogs. 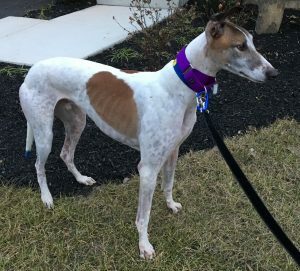 Since the passage on 11/6/18 of the Florida Constitutional Amendment #13, retired racing greyhounds available for adoption have dramatically declined as racing owners are keeping their greyhounds actively racing longer. This scenario is anticipated to change by late 2020 when more racing greyhounds will be retired. Until late 2020, Greyhound Welfare advises that approved adopters will have a longer wait time to adopt. 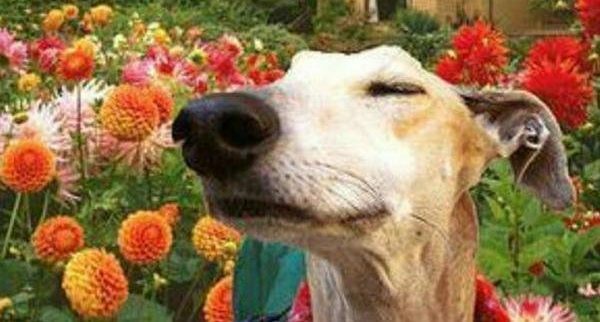 Rest assured Greyhound Welfare has reliable sources for retired racing greyhounds and will continue to bring them in to our foster program on their way to their forever homes. Greyhound Welfare appreciates adopter’s patience. Curious about greyhounds but not sure you want to commit to full-time ownership? Do you want to help a greyhound find his/her forever home? Consider Fostering! Greyhound Welfare has a well developed fostering program to guide our foster parents. We provide the supplies and mentor…you provide the love. Please complete a volunteer application. The retired greyhounds thank you.